The liver has a critical role in the metabolism, digestion, detoxification and elimination of substances from the body. The liver diseases are most prevalent and produce Reactive oxygen species which may lead to further progression of disease. This study is done to compare the oxidative stress parameters in hepatitis B virus infected patients and alcoholic hepatitis patients. The study was conducted in 3 groups with 50 individuals in each. First group comprised of normal healthy individuals, second group consisted alcoholic hepatitis patients and a third group made up of hepatitis B patients. When compared to controls, Erythrocyte MDA was significantly high and erythrocyte GSH was significantly low in both the groups of cases where as Plasma Ascorbic Acid levels were low along with Superoxide dismutase (SOD) and Catalase activities in both the groups of patients. When compared between alcoholic and hepatitis B patients, except superoxide dismutase and ascorbic acid, MDA, GSH and Catalase showed no significance. The liver enzymes were also significantly raised in both forms of Hepatitis, when compared to the controls. The AST/ALT ratio was reversed (>1) in Alcoholic Hepatitis patients as compared to Hepatitis B patients and normal individuals (<1). There was a significant correlation seen on comparison between oxidative stress parameters and liver enzymes in both chemically and biologically induced hepatitis. It is suggested that GSH, MDA in erythrocyte, SOD, Catalase and Plasma Ascorbic Acid can be made an effective tool in assessing the progression of the liver disease for timely intervention. Free radicals are chemical species possessing an impaired electron that can be considered as fragments of molecules and which are generally very reactive. They are produced continuously in cells either as accidental by-products of metabolism or deliberately during, for example, phagocytosis. Reactive free radicals formed within cells can oxidize biomolecules and lead to cell death and tissue injury. Cells have developed a comprehensive array of antioxidant defenses to prevent free radical formation or limit their damaging effects. These include enzymes to decompose peroxides, proteins to sequester transition metals and a range of compounds to ‘scavenge’ free radicals . Any tissue damage resulting from an imbalance between an excessive generation of oxidant compounds and insufficient antioxidant defense mechanism is known as oxidative stress . The liver plays a central and critical biochemical role in the metabolism, digestion, detoxification and elimination of substance from the body. Products derived from the digestion of food are processed, transformed and stored in the liver. It is also the main site of metabolism of exogenous compounds, such as drugs and toxins . While there are many causes of liver disease, they are generally present clinically in a few distinct patterns, usually classified as hepatocellular, Cholestatic (Obstructive) or mixed . However all etiologies lead to liver damage that ranges from acute hepatitis to hepatocellular carcinoma, through many inflammatory processes, apoptosis, necrosis, fibrosis that involve hepatocyte, Kupffer, stellate and endothelial cells. Any insult to the liver cells produce Reactive oxygen and nitrogen species (ROS, RNS), which in turn, is responsible for the induction and progression of liver disease, independently from its etiology. These free radicals are involved in the transcription and activation of a large series of cytokines and growth factors that, in turn, can contribute to further production of ROS and RNS . Thus the vicious cycle continues. The extent of cellular damage is manifested by either an increase in the oxidation products or a decrease in the antioxidant levels or both in our body. Hence by measuring the oxidative stress parameters, the extent of liver damage can be assessed. Globally, many people are addicted to alcoholism resulting in significant number of people suffering from alcoholic liver diseases. The number of people infected with Hepatitis B virus infection, all over the world, is also on the rise. Both the forms of hepatitis lead to hepatic damage of various intensity, ranging from mild hepatitis to gross hepatic failure. Although a lot of information is available regarding the biochemical changes and Oxidative Stress Parameters in Alcohol Induced Hepatitis (chemical injury) and Hepatitis B virus infection (biological injury) separately, but a comparative study, taking both the forms of hepatitis into consideration, is lacking. An attempt in the study was made to note is there any difference in the extent of oxidative stress caused by chemical and biological agents causing hepatitis. The study was performed between February 2007to July 2008 which is in accordance with the regulation of the ethical committee of Sri Devaraj Urs Medical College. The control group consisted of 50 normal, healthy individuals between the age group of 25 to 75 years from Kolar district. The second group consists of 50 clinically proven alcoholic hepatitis patients, aged between 25 to 75 years. The third group consisted of 50 clinically and serologically proven cases of Hepatitis B patients admitted in RL Jalappa Hospital and Research Center. Group 1: Smokers, alcoholics, history of any medications and Patient suffering from any disease. Group 2: Patients on chronic drug therapy, patients suffering from any other disease apart from alcoholic Hepatitis, Hepatitis due to any other cause apart from alcoholic Hepatitis. Group 3: Patients on chronic drug therapy, Hepatitis due to any cause other than Hepatitis B, patients suffering from any other disease apart from Hepatitis B. About 5ml of venous sample was taken from groups 1,2 & 3 under aseptic precautions of the 5ml of blood sample, 3 ml was collected in EDTA containing tubes for analysis of oxidative stress parameters and the remaining 2 ml in plain vacutainers for analyzing Liver Enzymes. Blood sample from the anticoagulant containing vacutainer was centrifuged at 3000rpm for 10 mins, supernatant plasma was used for ascorbic acid estimation. The buffy coat was discarded. The packed cells were suspended in equal volume of cold phosphate buffer saline and re-centrifuged. The supernatant was discarded. The washing of packed cells was repeated twice, the packed cells were used for analysis of GSH and MDA . The blood sample from plain vacutainers was centrifuged at 3000 rpm for 10 mins; the serum was aspirated and was further used for analyzing liver enzymes. Erythrocyte Glutathione (GSH) was estimated by DTNB method. Malondialdehyde (MDA) in Erythrocyte was evaluated by measuring the Thiobarbituric Acid reacting substances (TBARs). Superoxide dismutase in erythrocytes was assayed by colorimetric assay (Biovision kit). Erythrocyte Catalase activity was estimated by ELISA (Cell Biolabs Inc). The Liver Function Tests taken up for study – Aspartate Amino Transferase (AST), Alanine Amino Transferase (ALT), Gamma Glutamyl Transferase (GGT) and Alkaline Phosphatase (ALP) were measured by using standard methods adapted in the clinical laboratory. The values of all parameters were statistically analyzed using SPSS 15.0 software. A comparison of the mean values of oxidative stress parameters and liver enzymes were done separately between group 1and 2, group 1 and 3, group 2and 3 using independent t test. Pearson correlation was done to compare the oxidative stress parameters with liver enzymes. Table 1 shows the mean values and S.D of Erythrocyte Glutathione (GSH), Erythrocyte Malondialdehyde (MDA), SOD, Catalase and Plasma Ascorbic Acid in group 1 as 11.94±1.86, 8.67± 1.29, 1116+145.72, 56.1+6.37, 1.14± 0.21 respectively. Similarly the mean values in group 2 were 6.99 ±2.02, 12.43± 2.01, 1142 + 158.48, 37.7 + 4.68, 0.92±0.23 respectively. In group 3, the mean values measured for GSH, MDA, SOD, Catalase and plasma Ascorbic Acid were 7.69±2.13, 12.42±2.18, 957+65.75, 37.44+4.98 and 1.07 ± 0.19 respectively. When compared to controls Erythrocyte GSH was significantly low and MDA was significantly high in both groups of patients (p<0.005). Plasma Ascorbic acid and catalase levels were decreased in both the groups when compared to controls but significantly low (p<0.005) only in alcoholic hepatitis patients. When we compared the oxidative stress parameters between the two groups of patients only Plasma Ascorbic Acid and SOD showed significance (p<0.005) whereas Table 2 shows the measure of liver enzymes showed mean values and S.D of Serum Aspartate Transaminase (AST) in groups 1,2 and 3 as 28.12 ±10.21, 182.36 ±96.14, 240.1 ±192.40 respectively. The mean value and S.D of Serum Alanine Transaminase (ALT) were 32.40 ±11.90, 147.70 ±95.98, 297.50 ±237.55 respectively in groups 1,2 and 3. Serum Alkaline Phosphatase (ALP)and Serum Gamma Glutamyl Transferase(GGT) showed mean values and S.D as 150.84± 41.49 and 25.38 ±13.63 in group 1, 279.24 ±120.97 and 138.84 ±67.12 in group 2, 248.84 ±91.78 and 72.42 ±of 42.61in group 3 patients. The ratio of AST/ALT in the 3 groups were 0.96 ±. 0.5, 1. 38 ±0.37 and 0.81 ±0.18 respectively. Table 1: Comparison of Oxidative stress parameters in group1 (Control), group 2(Alcoholic Hepatitis) and group 3(Hepatitis B). Table 2: Comparison of liver enzymes in group 1(Control), group 2(Alcoholic Hepatitis) and group 3(Hepatitis B). Liver enzymes showed high significance (p<0.005) in group 2 and 3 patients when compared separately with group 1 controls. When we compared between group 2 and group 3 serum AST and GGT showed significant change (p<0.005) where as changes of serum ALT and ALP were insignificant (p>0.05). 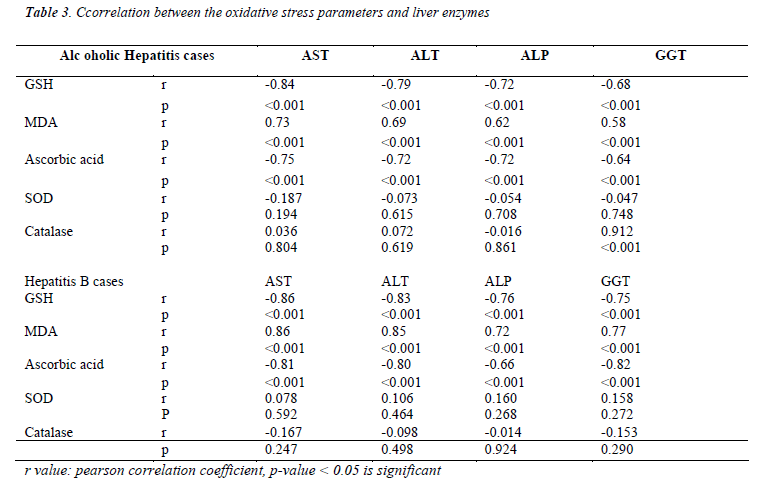 Table 3 shows the comparison of oxidative stress parameters with liver enzymes. Erythrocyte GSH and plasma ascorbic acid correlates negatively with all the liver enzymes and it is highly significant (p<0.005) in both alcoholic hepatitis and hepatitis B cases. Erythrocyte MDA correlates positively with liver enzymes which is also highly significant (p<0.005) in both the groups of patients. Catalase showed a positive correlation with GGT levels in alcoholic hepatitis group. Table 3: correlation between the oxidative stress parameters and liver enzymes. Oxidative stress is an underlying mechanism for the cell injury and ultimately fibrosis in many forms of liver injury. Increased levels or accelerated generation of reactive oxygen species and toxic degradative products of lipid peroxidation have been reported in the plasma of individuals with liver disease. Hence, by virtue of their increased presence in circulation, it is not unreasonable to suppose that they may account for the extra-hepatic tissue damage in liver diseases . The present study showed that in the control group which included normal, healthy individuals; Oxidative stress parameters which included Glutathione (GSH), Malondialdehyde (MDA), Superoxide Dismutase, Catalase and Ascorbic Acid were found to be in the considered normal range, which was concurring with the data from other studies [8,9]. The present study revealed that the patients suffering from liver disease either due Hepatitis B virus infection or excessive alcohol intake showed significant depletion (p<0.005) of GSH level when compared with controls, which is similar to the findings from other studies . Several factors contribute to the fall in GSH level. Most important is oxidative stress, which consumes GSH. Depletion of GSH renders the cell more susceptible to oxidative stress . Decreased Glutathione Reductase (GR) activity may be predominant cause of GSH depletion within RBC leading to serious consequences like increased lipid peroxidation and haemolysis . The other reasons for GSH depletion being, it acts as a co-factor for Glutathione Transferase (GST) during detoxification of xenobiotics including alcohol and also suppression of glutathione synthesis by ethanol [12,13]. However, when compared between group2 and 3, the mean values of GSH showed no significance (p>0.05). Results also revealed a significant rise (p<0.005) in the MDA levels in both group2 and group3 patients compared to group1, which is well in term with other studies . The raised MDA level reflects the oxidative injury due to alcohol and hepatitis B virus infection, which is attributed to free radical formation that subtracts hydrogen atoms from lipoproteins causing lipid peroxidation, of which MDA is the main product. But the levels of MDA did not vary significantly (p>0.05) when compared in group2 and group3 cases. Among the other oxidative stress marker enzymes estimated, Superoxide dismutase activity was found to be similar in controls and alcoholic hepatitis patients. However the enzyme activity showed a significant decrease in Hepatitis B patients, which was also observed in other studies . Catalase enzyme activity was found to be decreased in both alcoholic and hepatitis B groups as compared with the control group, which has also been reported in similar studies . Another relevant finding in the study was that the Ascorbic Acid levels were significantly lowered (p<0.005) in Alcoholic patients compared to controls, but the levels were insignificantly reduced (p>0.05) in case of Hepatitis B virus infection. These results corroborated well with previous studies [10,13]. However, a comparison of the Ascorbic Acid levels in group2 and group3, showed high significance (p<0.005). The possible explanation for this is that apart from the free radicals mediated depletion of ascorbic acid in hepatitis, alcohol directly reduces ascorbic acid levels in blood by impairing its absorption by damaging cell lining the stomach and intestines and disabling transport into the blood and altering Vitamin C metabolism and utilization [16-18]. The measure of liver enzymes revealed a significant rise in the levels of AST (p<0.005), ALT (p<0.005), ALP (p<0.005) and GGT (p<0.005) in both Hepatitis B virus infection and Alcoholics, compared to controls which also confirms the literature evidence [19-21]. The AST/ALT ratio was found to be <1 in controls as well in Hepatitis B, but >1 in Alcoholic Hepatitis patients. This reversal of AST/ALT ratio in Alcoholic Hepatitis patients is correlating with previous studies, [21,22] This is due to release of mitochondrial AST by alcohol itself or through its toxicity by its metabolites and/or oxidative stress . Whereas in case of Hepatitis B, ALT is typically higher than AST because of slower clearance . Thus the present study revealed a certain degree of oxidative stress and free radicals mediated damage in both Alcoholic Hepatitis and Hepatitis B virus infection. Earlier authors like Albano et al have postulated in their study that the generation of ethanol-derived free radicals, in alcoholism, is mainly due to the increased activity of cytochrome P-450 dependent monoxygenase system (cytochrome P-450 2E1) . The first breakdown product, acetaldehyde initiates much of the inflammation and fibrosis in alcoholic hepatitis. Acetaldehyde and lipid peroxidation products recruit leukocytes, resulting in production of more inflammatory cytokines. This elicits a vicious circle of inflammation that culminates in fibrosis and loss of hepatocytes . Thus hepatic ethanol overload is followed both by an increase in reactive oxygen species and by a decline of antioxidants. Obviously the latter can further deteriorate once lipid peroxidation has been stimulated. Researchers Rahamani et al and Waris et al in their works have shown that in Hepatitis B virus infection, HBx, the X gene product of Hepatitis B Virus genome, interacts with an outer mitochondrial voltage-dependent anion channel(VDAC3) and that this association leads to a decrease in the mitochondrial membrane potential and causes elevation of Reactive Oxygen Species [25,26]. When we compared between oxidative stress parameters and the liver enzymes in both groups of patients, erythrocyte GSH and plasma ascorbic acid correlates negatively and plasma MDA correlates positively with all the liver enzymes. A positive correlation was also observed with catalase and GGT levels in hepatitis caused due to chemical damage to the liver from alcohol. This shows the oxidative stress reflects the changes with liver enzymes. Hence we find a significant degree of oxidative stress present in both, Alcoholic Hepatitis and Hepatitis B virus infection. It was seen that the extent of damage caused due to oxidative stress was similar in both chemically and biologically induced hepatitis patients. Thus it can be recommended that further supplementation of antioxidants, along with other treatment modalities can yield better results and improve the prognosis of the patients. Beutler E, Wesst C, Blume KG. Removal of leukocytes and platelets from whole blood. J Lab Cli Med 1976;88:328-333. Sharmila U, Subramanya U, Mamatha K. Oxidantantioxidant status in colorectal cancer patients-before and after treatment. Indian Journal of Clinical Biochemistry 2004;19:80-83. Cheng J, Chen JM. Plasma superoxide dismutase measurement in children with viral hepatitis. Free Radic Res Commun. 1991;12-13:669-73. Gath L, Macsza¡ros I, Nameth H. Serum catalase enzyme activity in liver diseases. Acta Biol Hung. 1987;38(2):287-90. Feinman L. Absorption and utilization of nutrients in alcoholism. Alcohol Health and Research World 1989;13(3):207-210. Lieber CS. The influence of alcohol on nutritional status. Nutrition Reviews 1988;46(7):241-254. Lieber CS. Alcohol and nutrition: An overview.Alcohol Health & Research World 1989;13(3):197-205. Pratt DS, Kaplan MM. Evaluation of liver function. In: Kasper, Braunwald, Fauci, Hauser, Lango, Jameson. Harrison’s principles of internal medicine. 16th edition, United States of America: Mc Graw Hill; 2005:1813-1816. Dienstag JL, Isselbacher KJ. Acute viral hepatitis. In: Kasper, Braunwald, Fauci, Hauser, Lango, Jameson. Harrison’s principles of internal medicine. 16th edition, United States of America: Mc Graw Hill; 2005:1822-1838. Mailliard ME, Sorrell MF. Alcoholic liver disease. In: Kasper, Braunwald, Fauci, Hauser, Lango, Jameson. Harrison’s principles of internal medicine. 16th edition, United States of America: Mc Graw Hill; 2005:1855-1858. Rahmani Z,Huh KW,Lasher RL,Siddiqui A.Hepatitis B virus X protein colocalize to mitochondria with a human voltage-dependent anion channel,hVDAC3 and alters its transmembrane potential. J Virol 2000;74:2840-2846.